Lucio Papirio dittatore is the fourth Hasse piece to be performed in London by Ensemble Serse. 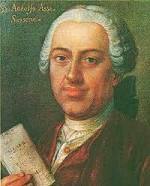 The 28th of his 60 or so operas, it was first heard in Dresden in 1742, the sixth setting of an Apostolo Zeno libretto originally written for Antonio Caldara (Vienna, 1719). After Hasse, at least 11 further composers were drawn to it, including Paisiello, Anfossi and, in 1780, the 20-year-old Cherubini for his first opera. Hasse’s handling of Zeno’s libretto was free: according to the programme, 16 of the arias had new texts. (Copyright apart, can we today imagine 17 different composers thinking, say, Peter Grimes a successful libretto and then resetting it, with their modifications, to their own music?) Hasse wrote a seven-singer opera: for his wife, Faustina Bordoni, as Papiria, Lucius’s daughter; for Annibale in the title role; for Ventura Rocchetti (the castrato set to displace Annibali as Dresden’s primo uomo) as Quintus Fabius, her husband; and for a soprano, two further castratos and a baritone. Ensemble Serse kept a similar distribution—four countertenors, two female voices, one baritone—but assigned one of the male roles, Cominio, to a woman, and Quintus’s sister, Rutilia (whom Cominio loves), to a countertenor. Imagination had to work during their exchanges. The opera was performed uncut. With two short intervals, it lasted—and held our attention securely—for nearly five hours. (We’d been advised to bring refreshments and cushions to the church.) Burney called Hasse ‘the most natural, elegant, and judicious composer of vocal music’. There were also many surprises: bold, unusual rhythmic, harmonic and structural devices: startling chromaticisms; subtle interweavings of recitative, arioso and aria; some striking orchestration. The drama itself is a stiff affair. Lucius Papirius, elected Dictator of Rome in 325 and again in 309 bc, is an odd choice of operatic hero. Livy tells disapprovingly of his lustful cruelty to a beautiful boy, which caused an outcry. In Zeno’s libretto, he condemns his captain, the popular, victorious Quintus Fabius, to death for disobeying an order; to the distress of Papiria, torn between filial respect and love for her husband; of Quintus’s father, Marcus Fabius; and of Rutilia. On the last page of the libretto Lucius relents, and tells Quintus to be less impetuous in future. The company sings a brief, almost perfunctory chorus: ‘Gloomy horror no longer clouds the joy of victory’. The singers were all pleasingly fluent, running through difficult divisions with aplomb. Elisabeth Fleming was a tender, moving Papiria, with shapely phrasing. Benjamin Williams was a dignified, noble Lucio, though some low notes were disconcertingly unrelated in timbre to those above. Calvin Wells was a dashing Quinto, if over-ready to produce some rather horrid screams as a climax to his cadenzas. Everyone, in fact, even Fleming, had moments of stridency unnecessary in the excellent acoustics of the Grosvenor Chapel. Meili Lin was a charming Marco Fabio, hardly suggesting a venerable patrician, but good to hear. He had the liveliest stage presence, listening, looking, reacting; the others, expressively though they sang, tended to address scores on music- stands rather than their listeners. Roderick Morris as Rutilia, Catherine Pope as Cominio and Christopher Jacklin as Servilio, rival for Rutilia’s hand, completed the cast. Extended, elaborate cadenzas abounded. There were no measured, accurate trills: a perfect ‘shake’ seems to be one necessary accomplishment that even the specialist singers of our day fail to acquire. At the harpsichord, Thomas Foster, alert to the many fine details of the score, directed a period band of 12. A bilingual libretto in large, clear type was provided. Gluck’s Orfeo was 20 years in the future. Nearly 20 years after that, Mozart refashioned what he called a ‘real opera’ from the Clemenza di Tito that Metastasio had written for Caldara in 1734. Tito was the first Mozart opera heard in London. It’s no rarity now, but in 1946 Dent could still declare that ‘for the stage of today it can only be considered as a museum piece’. Inevitable thoughts about changing fashions, reforms, rediscoveries flitted across simple surrender to this enthusiastic, committed, lovingly studied Hasse revival, a copious, thoroughly enjoyable musical extravaganza, even when shorn of scenic pomp.